1. In a bowl, mix flour, cocoa, baking powder, and salt. In a small bowl, whisk eggs, sugar, buttermilk, and melted butter to blend. Stir into dry ingredients until well blended. Chill until cold, at least 1 hour or up to 3 hours. 2. Scrape dough onto a generously floured surface. With floured hands, pat dough out to about 1/2 inch thick. With a 3-inch doughnut cutter, cut out doughnuts. Pat together scraps of dough and cut again. (Alternately, shape dough into ropes about 5 inches long and 1/2 inch thick; join rope ends to form doughnuts.) Place doughnuts on a well-floured baking sheet. 3. Meanwhile, fill an electric deep-fryer to the fill line or pour about 4 inches of oil into a 5- to 6-quart pan; heat to 375°F (190 C) (see Fry Right). Place one doughnut at a time onto a wide spatula and gently slide into oil, frying up to three at a time. Cook, turning once, until puffy and cooked through, 3 to 4 minutes total (to check timing, cut first one to test). With a slotted spoon, transfer doughnuts to paper towels to drain. Repeat to fry remaining doughnuts. 4. When cool enough to handle, dip the top half of each doughnut in warm mocha glaze and place on a plate. Let stand until glaze is set, about 5 minutes. Makes about 16 (3-inch) doughnuts. In a heatproof bowl, combine 6 ounces chopped semisweet chocolate, 1/2 cup whipping cream, 1 tablespoon butter, 2 teaspoons corn syrup, and 1 teaspoon instant espresso powder. Bring a few inches of water to a boil in a pan; remove from heat. Place bowl over water and let stand, stirring occasionally, until smooth, about 10 minutes. I have made this recipe several times. My friends and family love them. So do I.
I found the recipe hard to understand but when my mother (72) tried them they were very nice. It was so deliciou! 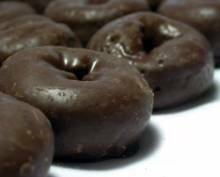 I can consume 10 chocolate donuts in 2 days! Is it meant to say 11 1/2 cups sugar? Or is that a typo? It's 1 1/2 cups sugar, not 11 1/2 cups sugar. Not a typo. They're yummy. I can eat them every day. Delicous! Just perfectly tasty, moist, smelling, EVERYTHING PERFECT! Family and friends loved them. The dough is VERY soft to handle but with patience and lots of flour and/or cocoa on the bench, it can be done. Nice and soft and chocolatey. Really liked the results of this recipe. Topped them with sprinkles. Next time I will cut them out the night before and refrigerate them so that I can fry them more quickly in the morning. Recommend this recipe. These are amazing. I was surprised at how rich the chocolate flavor was even though I used Hershey's cocoa. I did sift the dry ingredients because my cocoa was very lumpy. Can these doughnuts be baked in the oven? Trying to be health conscious and avoid frying if possible...please let me know. Someone will have to elaborate on how they handled this dough which was so wet and soft. Even with proper fry techniques and temperature they absorbed way to much oil. This was like Buttermilk Old Fashion Donuts. Tip: make sure the grease level is right, to get the proper temperature on the grease. I was wondering instead of rolling it out can you put it in a cake donut maker and just plop it in the oil because I really don't want to roll it out. My family and frinds all love them!! They are awesome! THESE DOUGHNUTS WERE FRICKIING AMAZING!!!!!!!! It says, 2 1/2 cups of flour. In other words, its 1 cup of sugar right? I've been searching for a doughnut like this. Thank you for sharing.